Edited by Malan Rietveld and Perrine Toledano (Columbia University Press, May 2017). Sovereign wealth funds (SWFs) can be effective tools for national resources revenue management. These state-owned investments, funded by commodity exports, foreign exchange reserves, or other national assets, are adaptable to the challenges posed by financial shocks and have been successfully employed in an increasing number of countries. The number of SWFs continues to grow, with the largest funds managing trillions of dollars in assets between them. However, given the significant variations amongst SWFs, it can be difficult to compare funds that differ in size, scope and mandates. This book provides a sorely needed practical look at how these funds work—and how they should work. 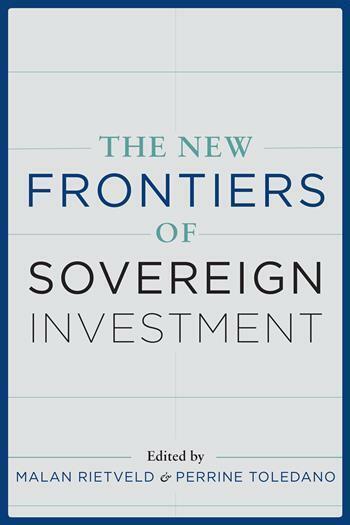 The New Frontiers of Sovereign Investment combines the insights and experience of academic economists and practitioners from several funds to survey a diverse financial landscape and establish the challenging topical questions facing a broad range of SWFs today: whether and how to serve both economic development and financial returns? Whether responsible investment will enhance long-term returns? How can fiscal rules for SWFs be improved to meet emerging economic challenges? The book considers these questions as they apply to both long-established and newer SWFs. Featuring contributions from sovereign wealth practitioners from Alberta’s AIMCo, the Nigerian Sovereign Investment Authority and the New Zealand Superannuation Fund, as well as analysis by scholars at the forefront of sovereign investment, this volume provides timely and much-needed information on these rapidly evolving institutions. To order through Columbia University Press, click here. To order on Amazon.com click here.